72% of self-published authors never sell more than 1,000 books! Are YOU one of them? Not when you follow my proven book marketing system. 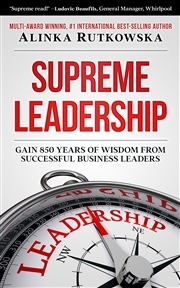 Discover how to sell books by the truckload...even if you haven't sold a single copy yet. WARNING: contains new innovative ideas that are effective in marketing more books. Get your free copy of this 2016 Readers' Favorite Book Award Winner now! I transform struggling writers into profitable authors. Because I was shocked when I discovered that 72% of self-published authors never sell more than 1,000 books. That's why I devoted myself to creating a system which translates the sales and marketing strategies I learnt in business school and the corporate world into actionable steps authors can implement right now to start selling their books. I broke it all down in my award-winning guide "How I Sold 80,000" books which you can download on Amazon right now. Go to authorremake.com to watch a free video tutorial on which 20% of your marketing efforts give you 80% of results. Alinka Rutkowska is multi-award-winning and #1 international best-selling author and coach. She's the founder and CEO of LibraryBub, which connects librarians with award-winning and best-selling books from independent publishers. She's the founder and administrator of the Readers' Favorite forum for authors. She's the founder and host of the "5-Figure Author Challenge," which gives authors winning strategies to get to 5 figures in 5 months. She's been featured on Fox Business Network, affiliates of ABC and NBC, Author Marketing Club, The Author Hangout, Kindlepreneur, Book Marketing Mentors, Examiner, She Knows, She Writes, The Writer's Life and many more.Alinka can't wait to connect with you. A Fantastic Resource. If only I had started with Alinka Rutkowska’s “How I Sold 80,000 Books”. There’s no fluff here, just clear, concise steps one can take to successfully market a book. Probably the best and most comprehensive one-stop guide I have seen, it provides a clear path for authors, agents and publishers alike. There are several pillars which support marketing success, the primary one being, as Alinka properly states, the product. The book world is awash with the dregs of poorly written works. So, how do you separate your crystalline work of literature from the rest? I would begin by reading “How I Sold 80,000 Books”. Alinka Rutkowska provides a wealth of information in "How I Sold 80,000 Books”. Whether you're a seasoned author or just starting out, there are plenty of tips that are sure to be helpful. Clear details and direction are provided along with links to various resources. I had the privilege of meeting Alinka through the Readers' Favorite forum. She is extremely knowledgeable and always willing to help authors in whatever way she can. I highly recommend this little gem of a book! The must have resource for every author struggling with how to promote their book. “How I Sold 80,000 Books” by Alinka Rutkowska covers it all from web page to social media to promotion, sales and everything in between. Do you know how to get reviews from Amazon Top Reviewers? It’s in “How I Sold 80,000 Books” by Alinka Rutkowska. Need a list of top book award contests? You will find that in “How I Sold 80,000 Books” by Alinka Rutkowska. 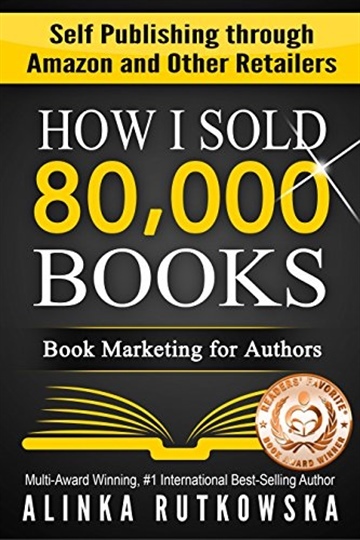 If you are a new author or if you have published 100 books, you will find suggestions and tips in “How I Sold 80,000 Books” that is sure to help you reach your goals. Alinka Rutkowska’s “How I Sold 80,000 Books” is a ‘must have’ for all new and seasoned authors. This step-by-step guide gives straightforward, tried and tested methods, with detailed advice on how to avoid those bumps in the road that every writer encounters on their journey to becoming a best-selling author. It covers everything from the moment you decide to write your novel to getting your work noticed by readers, including the editing process, formatting and book covers, getting your book in digital and printed format, reviews and awards, and most importantly, how to promote your work. She details the workings of social networks such as Facebook and Twitter, giving a comprehensive explanation of how to use them to your advantage. Unlike most ‘how to’ books I have read in the past, Alinka presents the information in an easy-to-understand, friendly manner that makes you feel as if you are talking directly to the author. Although Alinka primarily writes children’s books, she is also a coach for budding authors, and the information put forth can be applied to any genre, aiding all authors, even those who have taken a more traditional route with a large publishing house. The links included in the book are like gold dust, and you will find yourself watching/reading them over and over again as you forge your way through the publishing world. There are also direct links to sites such as Readers’ Favorite and book blogs, which will save you hours of Internet trawling time, allowing you to spend more time doing the thing you love—writing your best-selling novel. Publishing is a ruthless market where your work is quickly swallowed up in the masses of books released each year. Alinka demonstrates a path that prevents your work becoming invisible and forces it out into the limelight. Any author who wishes for their book to be seen should read Alinka’s “How I sold 80,000 Books” and follow the advice inside. I promise you, it will not steer you wrong, and I only wish that I’d had access to this when I first started out. It would have saved me months of work.